I’m convinced the show just takes place in the future versus Control. It’s not defeated but it goes into waiting for Disco to reappear. This show really does not respect its audience at all. Everything is so predictable, obvious, tropey. Well except where it is so paradoxical you think to yourself "na they wouldn't" but then they do. Just a small update, I'm in season 2 ep 10 of DS9 and I must admit, every character had some kind of development, even Nog is likable, hell, Quark is cool, ODO's monologue in his episode acting like a Noir detective made me laugh a lot. Yeah they had better announce this spinoff soon. Number one has been critically underutilized. I do hope we get to see more of this Enterprise in some shape or form. So this is how Discovery's quirks get ironed out of the Star Trek that has come before. I did like this episode. I do like the potential for where this can go. I guess this could be Voyager-like, in the sense of a ship, isolated. I wonder if Spock will simply head back to the enterprise - that torpedo lodged in its hull might have something to do with that - or if they end up somehow with a 'split' Spock. I'm guessing the former. One of my complaints about Disco so far has been the lack of more intimate familiarity with more of the crew, the wide cast of characters, most of whom get fleeting treatment. As opposed to previous Treks, which had a fairly homely sense of family onboard. 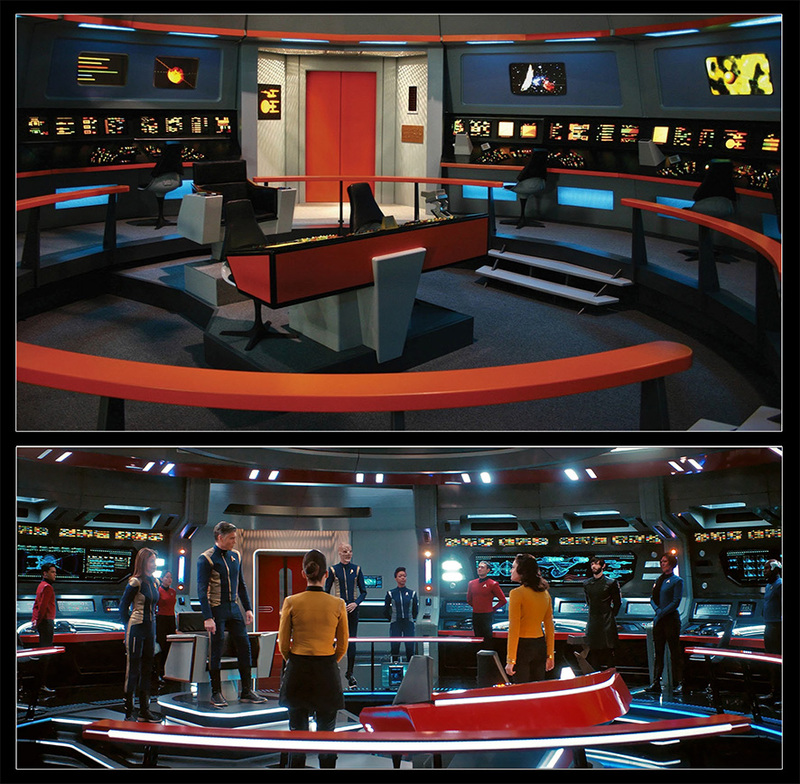 Maybe this reduced crew set will allow a more traditional Trek-like treatment of the ship and crew going forward. But I guess the open questions are, what will be the pretext for Discovery to go 'star trekking', as opposed to simply staying around that planet Michael's Mom stayed at... and what timeframe they'll be in... will there be interaction with familiar Star Trek factions, or even a future federation, or will it be strictly isolated in new territory. Let's see! edit - oh, and Culber :( I wonder if that's really the end. That goodbye felt emotionally complicated. But maybe they will let it sit as a nuanced ending for that relationship, rather than reuniting them. edit 2 - am slightly annoyed about the short treks thing. I actually loved the character here, but for me it was all totally new - as far as I know there's no (legal) way to watch those if you're in the international audience? They're not on netflix. Weird to incorporate them in such an important way and as part of the 'previously...'s if your international audience cannot watch them. Maybe I'm wrong, though, maybe they're up 'officially' somewhere for the international audience? They didn’t retcon his death and resurrect him only to write him off again. I am sure he will make the transition to next season on this ship. The Short Treks are on Netflix under Trailers, it's dumb. I was sure I looked there back when they started coming out... but maybe I looked too early. Yeah... we can presume there's going to be some cross-traffic between the enterprise and disco in the next episode, given Spock. That is, if Culber even left. Although he said he was going to join the Enterprise, there was no sign of him in the exit to Enterprise, or on the Enterprise after. And my guess is Culber and Spock will switch places due to whatever happens. Just realised that out of all the short treks, only the Mudd centric one seems to have no connection to Disco S2. I didn't get that suggestion at all. Discovery will go off to the future, not be erased from the timeline. Yeah I don't see this as Discovery being erased from the timeline at all, just going forward in time. Where I got that vibe from was from Saru. Michael: Of course, as long as Discovery exists here and now, this will never be over. Saru: You're proposing we remove Discovery from the galactic equation...entirely? Pike: How exactly are we supposed to do that? Michael: The time crystal. This is why we have it. To take the data out of this time. So control can never get it. Discovery has to go to the future. Looking back I think it could be read either way at this point. That it's simply going to the future, or that it's going to be excised from the timeline entirely. But I'd suggest that if it's simply going to the future, with knowledge of it remaining, that it's not really a situation that will 'ever be over' wrt Control. My strong impression from the first watch of that scene was that they were going to use the time crystal to move Discovery to another, future timeline. And that this would also tidy up why we never heard about Spore drives, or about Michael, in the 'current' Star Trek past. But I guess now I'm 50:50 on that. Did they explain why all of this is needed? Is the rest of Star Fleet unable to handle one of their divisions going rogue? I mean they had time to call the bloody Enterprise to come over, can they not get the rest of star Fleet to aid, it's ludicrous! How on Earth the plan to go through all this trouble and think Control will not continue to try and kill the rest of all life. Sigh. Also why can't they just park Discovery on the middle of intergalactic space while they purge Control....how is that not easier than flying the whole thing into the future? Control shut down the long range communications network. They can only communicate to ships and planets nearby. Can't call for Starfleet if the phone is dead. As for why not park Discovery in the middle of nowhere, I got a better one. Why not park it in the Mirror Universe? They have the coordinates for that jump on record and the Spore Drive is online. Well, was online. They said ship-to-ship was fine but didn't specify range. And they could jump to Starfleet HQ and literally walk to the Chief of Staff's desk if needs be. I missed that about the communications equipment, thanks for clarifying! Yep I agree, it makes no sense beyond they thinking future Michael has all the answers. Hey that's right, why not just go to Starfleet HQ directly? Would they not have a massive fleet stationed at their HQ to go hunt the section 32 vessels? You've clearly not watched enough Star Trek if you think there's ever any friendly ships in range that aren't the Enterprise. Oh, there is genuinely some issues around trying to sell the idea that this is the only way to keep it out of Control's hands for the time being. I was being facetious about Trek tropes. They’re still rebuilding after the war. The Klingons were literally approaching Earth. I would almost assume that, since Control has the ability to affect any ship and any person it comes in contact with, that they'd want to isolate Control from the rest of Starfleet as much as possible. It has a single-minded fixation upon Burnham and the Sphere data, so they're using that to their advantage by not involving the rest of Starfleet--the more ships that are present, the more that Control could potentially take command of. By exploiting Control's fixation on the Sphere, they're trying to keep collateral damage as low as possible by leading Control to them and involving as few ships as they can. Of course it would be great if they explained that in the actual text, too. I’m reasonably certain that Discovery is the Borg’s origin story. Control wanted the sphere’s data to become ‘fully conscious’ - whatever that means, since it is clearly already fully conscious given that it is capable of wanting to acquire more knowledge and is able to enact complex strategy. With this data, control wipes out the universe. If the data disappears along with the ship into the distant future, control is unable to get to it, and is therefore not the instantly all powerful being it wants to be - so it spends the rest of eternity assimilating knowledge and species in the hope of replicating all of the sphere data. Hence Borg. I’d bet on it. I could bet they don't want to risk doing that because such a jump could kill Stammats and honestly I would rather be stuck in the future than in that universe. I mean they can't really go back once they are there since the Discovery is the only semi-reliable way of crossing universes unlike time-travel, which many things in Trek can do "relatively" safe. I can buy that, nice explanation but yeah if they would mention this that would be great. Sure this is a fine take I could get behind if they bothered even hinting at it in the show,However they still need to tell Starfleet about control anyway. They are in damage control and capitalizing on Control wanting the sphere data, but elect to get rid of the potentially helpful data instead of concealing it by literally putting Discovery out of reach of control somewhere far. They could use that data to help them fight control, which they still need to do. If by the "potentially helpful data" you mean the Sphere data, the whole point is that possessing the data, even sealed and further encrypted, would be putting Starfleet at risk. They can't weaponize the data without putting whoever holds it at risk. By moving the data to the future, they remove the risk of (current) Control possessing it, after which Starfleet can make moves against Control in the current timeline. But there's no way to attack Control directly with the Sphere data still in play without risking Control assimilating more ships to attack the Discovery. Discovery and the data have to be taken out of the equation entirely first. We didn't get them when CBS all access did. They only came to Netflix right before S2 started, with barely an announcement. How exactly do they notify Starfleet since Control has cut them of from subspace communications? I mean contacting Starfleet was the first thing they tried to do. Sure I understand that's what they are doing , I just find it silly. They could achieve the same by just placing Discovery in a different Galaxy and randomly drop data as they investigate the sphere's archive . I mean they could also just copy the data put it in a different Galaxy and blow up the backup in the ship (as it should be satisfied it won't be lost). It just sounds unearned to say that the only path is going to the future because there are some signals saying so given that they don't even know the extent of Controls influence, for all they know without this data they would be sealing their fate on figuring out a bunch of things to counter Control. They know from Michael's mother that all attempts to protect the data end in Control destroying the universe, iirc. There's no reason to believe that doing the same thing again would end differently. The only path where she hasn't seen the outcome was a path where the Sphere data was taken out of play entirely. That's the whole reason why they were trying to send it to the future with Dr. Burnham to begin with, because they know keeping it ends in failure. My understanding per Spock is that the current timeline was never observed by her mother as she has lost her power to influence the timeline. They are flying blind here. They are going with what appears to be future Michael telling them to do this, but clearly future Michael would not be able to tell them which way is better, just her own way. Yes, that's correct, we agree on that. But Dr. Burnham has seen enough timelines where she was sure that keeping the data ends in failure, so they're flying blind by trying a method that they haven't already tried—sending the data away instead of trying to protect it like you proposed, because all other attempts to protect it that Dr. Burnham saw ended in failure. They should just move the data to a flash drive and then smash it, throwing the fragments into a star. They have the schematics for the Red Angel suit and its memory storage tech, after all, and moving the data to the suit worked before (except for Leland's interference).